Memorial Day & the Story of the Higgins Boat | A Continuous Lean. The federal holiday Memorial Day began in 1865 in Charleston, South Carolina by formerly enslaved Africans to honor the dead soldiers of the Union army. Eventually the holiday was expanded and today Memorial Day honors all Americans that currently serve, have served, and of course, those that gave the ultimate sacrifice for their country. Being someone who has a keen interest in the WWII conflict (especially enjoying the work of historian Stephen E. Ambrose) I think it fitting on this day to highlight Andrew Higgins, a person of great service to America (and intrigue to me) as the inventor and builder of the Higgins Boat. The landing craft that somewhat famously became synonymous with the industrious man who created it, saw action in every theater in which Americans fought and dramatically altered the outcome of World War II. Andrew Higgins got his start in business in Louisiana as a wood importer and eventually transformed his company Higgins Industries into a large New Orleans based ship builder. In the 1930s Higgins created a shallow-draft craft for use in the Louisiana bayou called the Eureka boat. After trying in vain to develop its own landing craft in the late 1930s, the U.S. Navy eventually commissioned an adapted Eureka boat from Higgins with a quick deploying ramp-bowed design for use by the Marines. Made almost entirely from wood (to save on crucial war materials) the Higgins Boat could operate in shallow water, easily land its bow and then quickly retract after deploying up to 36 soldiers. The Landing Craft, Vehicle, Personnel (LCVP) as it is officially known, has since become one of the most iconic and important inventions that helped America win WWII. Up to 20,000 Higgins Boats were made during WWII and the landing craft served most famously in Normandy on D-Day. Higgins boats were also used much earlier in places like North Africa and Sicily. 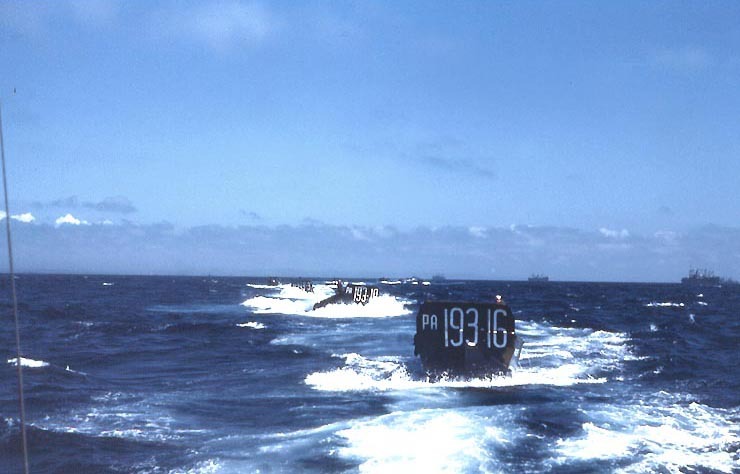 The Marines used the LCVPs at Iwo Jima and extensively throughout the Pacific theater. Higgins’ legacy remains and should be honored this and every Memorial Day. A Higgins boat during the battle of Iwo Jima. Great photos! Ike said that the Higgins boat was a main reason we won WWII in the European theatre. Correction: “Memorial Day honors all Americans that currently serve, have served, and of course, those that gave the ultimate sacrifice for their country.” Actually Memorial Day is only for those that fell in battle. Veteran’s Day is for those that served honorably and Armed Forces Day is for those that currently serve. There are three distinct official days. Shocked! Nice research; thanks for the memories. Thanks so much for this. We see so many pictures of these boats from WWII in documentaries, etc. It’s great to learn more about their origin. Great post, Michael. Didn’t know much about the Higgins boat until now. Great photos. Thanks for blogging about this. Great story. Now do one on wooden boats: Vintage Chris-Crafts, Century’s, Hacker Crafts, and Gar Woods. They may be the most beautifully crafted things America has ever created. Woody, already have it coming up! Don’t you worry sir. Great post! My grandfather was a landing craft coxswain during WWII and piloted Higgins boats (LCPs and LCVPs), participating in amphibious operations spanning the African, European, and Pacific campaigns. Thanks for posting the link to the operating manual – it’s a great find. Terrific topic. My dad went ashore on D-Day in one of these Higgins boats. All the men hated riding in them. “We were like sitting ducks out there!”, he said. Great Post Michael, X2 on Woody’s request! Higginsâ€”in addition to the LCPs and LCVPsâ€”also built its share (199) of the PT boats that served in the Pacific Theater and elsewhere. Amazing craft, generally powered by 3 1,500-hp Packard engines. I am originally from La. and we go to the WW II museum when we are there. It has a plethora of information about the design and construction of the Higgins Boat. The best is Higgins saw a pilot testing one in Lake Pontchatrain and the pilot wasn’t doing very well, he turned to his Supt. and said, “Fire that Pilot!” Of course the pilot was Higgins’ own son. Also down the street there is a restaurant that is called Couchon and serves pork that comes from the pigs that the chef / owner raises on the north shore of Lake Ponchatrain (I think). If you ever get to NOLA get by there. That area and that museum is your style. Mr Williams, I do appreciate the writing, the pics, and the love. I live in New Orleans, and know several Higgins, a few of which have naval service under there belts. Done with the bragging now… I honestly live next door to Ambrose’s house that he and his family, and chickens, lived in while a professor at UNO. It is languishing in a half state of post-K repair. The beauty gets lost sometimes down here. Seems you’re due another trip to Louisiana. With Higgins hailing from there and Stephen Ambrose calling New Orleans home for so many years.